We offer a luxury fully equipped self catering guest lodge, situated in the friendly and beautiful environment of the Zululand Coast. You’ll find us on the main road to Sodwana Bay 6,7km from the circle in Mbazwana on the righthand side. GPS Coordinates: E32 37 532 and S27 30 611. We can accommodate 16 people in the main house which is ideal for groups, families, friends, fishermen and divers. The house consists of four bedrooms (4 beds) en suite. Digital safe’s provided for each room. Ceiling fans throughout the house and aircon’s in all rooms. The rest of the house consists of a very spacious open plan, a huge kithchen, bar and living room with full DSTV. An enclosed braai lapa, gas braai and dart board on the patio, garden, pool and splashpool adjacent to the house are available for your enjoyment. (Bring your own darts). Newly built laundry with a bath for kids available. The whole property is fenced in with a brick wall and sliding gate at the entrance with armed response. Parking for boats with fish cleaning, scuba gear and boat wash facilities. Ideal for corporate groups and team building (packages available). A 5 sleeper cottage is also part of the lodge. This consists of two bedrooms en-suite and a bed in the living area. Open plan kitchen, living area with TV and an enclosed braai area. (Bring your own decoder for full DSTV and darts.) Closed patio with dining table and dart board. Ceiling fans throughout the house and airconditioned rooms. A two sleeper flatlet with small kitchenette, private toilet and shower also available. Ceiling fan and aircon in room. Own patio but share splashpool and braai lapa with cottage. New upgrade is the Bush Camp with one room (2 beds) with ceiling fan and mobile aircon. Shower and toilet a few steps from room with small kitchenette/patio. Totally private. Pools are for the use of the entire lodge and its occupants. Please be aware that there is a gate entrance fee payable to the park/beach, attached is a price list. Thank you for a most wonderful time that we spent on your boat with you. You are certainly a very worthy and capable skipper. Thanks for your hospitality. The fishing was fantastic, and am looking forward to having some time with my family. I had a great day on the boat with Johan. Dankie!!! Dit was n awesome trip!!! Julle is legends!! Baie, baie dankie vir julle gasvryheid. Julle is sowaar ‘n voorbeeld vir ons. Ons kyk op na julle wat soveel passie het vir die see en vir visvang. Dankie vir alles wat julle ons geleer het en vir julle moeite met ons kinders. Ons het dit vreeslik baie geniet hier by julle. Ons sien julle definitief weer!! Ek will net namens ons span baie dankie se vir die woderlike week wat ons saam met julle op Sodwana spandeer het. Die hoogtepunt was natuurlik die Marlyn. Wil net baie dankie sê, dat ons die naweek by julle kon bly ! Julle het voorwaar ‘n stunning plek, ons sal definitief terug wees ! Voel of ons ‘n week vakansie gehad het en ons was maar net vir een aand daar. Baie dankie vir alles, ons het dit regtig baie geniet en baie Lekker gekuier. Baie-baie dankie vir die sertifikaat, julle gasvryheid, jou hulp en ondersteuning en dat jy die fantastieste “skipper” “deck-hand” ystervrou en visser-vrou is wat ek ooit in my lewe ontmoet het. Ek wil net namens die manne van ZIZWE baie dankie se vir n wonderlikke tyd saam met julle. Dis iets wat ons nooit sal vergeet nie. Baie dankie vir tannie hulle se gas vryheid, dit was regtig n baie lekker naweek. Tannie hulle sal ons verseker weer sien. Julle doen n wonderlike werk en hou so aan! Sterke met die seisoen wat voorle, hoop julle vang al die grottes. Groete vir oom Johan en mooi bly. Baie dankie vir jul vriendelikheid en gasvryheid! Ons het dit baie geniet hier by julle! Ons het so Lekker gebly by die Seevarkies in Sodwana*** Dankie tannie Elize Smith & oom Johan vir die ongelooflike gasvryheid en vriendelikheid !!! Seevarkie Lodge is gr8 !!!! Many thanks for some fantastic days with you. We all 4 really enjoyed being with you and your great hospitality. It was so fun to be at sea. We will think about it with joy for many years. It's great experiences you have given us, thank you very much. We hope to come back one day. Weereens baie dankie vir die wonderlike prys wat julle vir Hannes gegee het, die verblyf was fantasties en die visvang uit ‘n ander wereld. We were awarded a number of prizes last year for our two Marlin and our overall 5th position in the Billfish 15000. One of those was a 4 night stay for 16 people at SEEVARKIE Lodge with Johan and Elize Smit. Staying at the coast myself, I rarely use these type prizes, but this year we decided to take a break and just have a nice weekend away with the our wives coming along as well. I cannot show enough appreciation for how we were received at the Lodge. From the very first call to Elize she went out of her way to accommodate us. So far, that she even booked us over a long weekend. The facilities were great. Everything an angler could want. Ample boat parking, comfortable rooms, huge entertainment area with lots of wood and very importantly – ICE (for the cool drinks obviously). Our prize included a one day charter and Johan took us out on Seevarkie. I was joined by my wife, Candice and a friend of ours Michelle Richards. Both of these ladies very avid and competent anglers, having obtained their natal colours for deep sea angling. What a great day it was. Johan is an absolute gentleman and clearly knows these waters well. We had a number of small tuna in no time but the biggest surprise was getting a Queenfish on one of the Sailfish baits. Experienced as he is, Johan turned back to the area and each of the girls landed a Queenfish of their own. Mine and Candy’s weighed in just under 8Kg and Michelle’s just under 11Kg. 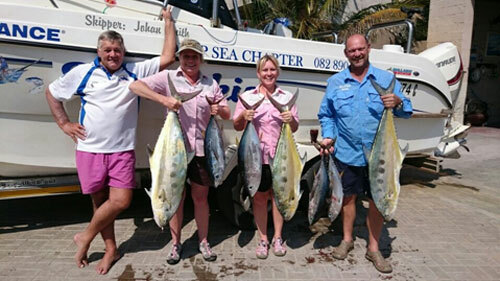 We believe that could have been a potential SA record for ladies – but only realised it after cutting up the fish (next time Michelle) Great smiles all round. We even got taken by a sailfish on the way back, but a “Groot ongeluk” saw the fish break the leader. Great fun none the less. I have included a pic of our catch for the day. A fantastic prize, fantastic lodge and even better hosts. Thank you Seevarkies for a memorable weekend. Johan Coetzer and all the friends from Warner beach. Weereens baie dankie vir julle gasvryheid en moeite, ek en Herman het die trip terdee geniet en as als goedgaan sien ons julle volgende jaar weer.